A 45-gram serving of dry sona masoori rice, which is equivalent to about 1 cup of cooked rice, contains 160 calories. By comparison, a 45-gram serving of uncooked long-grain rice contains 164 calories. Balancing your calorie intake is essential for weight maintenance and long-term health. Knowing the amount of calories in a serving of sona masoori rice can make it easier for you to track and balance your calorie intake. Most the calories in the sona masoori rice come from its carbohydrate content. That same 45-gram serving of dry rice contains 35 grams of carbohydrates. Sona masoori rice does not contain any fiber. Carbohydrates are an essential nutrient, and should provide most of your caloric intake. They provide your body with energy and promote the proper functioning of your heart, brain, liver and kidneys. The Dietary Guidelines for Americans, 2010 recommend that you obtain 45 to 65 percent of your calories from carbohydrates, most of which should derive from nutritious foods. While moderate amounts of low-fiber grains fit within a healthy diet, choose higher fiber varieties, such as brown rice, wild rice and oats, most often. Sona masoori rice does provide some protein, with 4 grams of protein in a 45-gram serving. 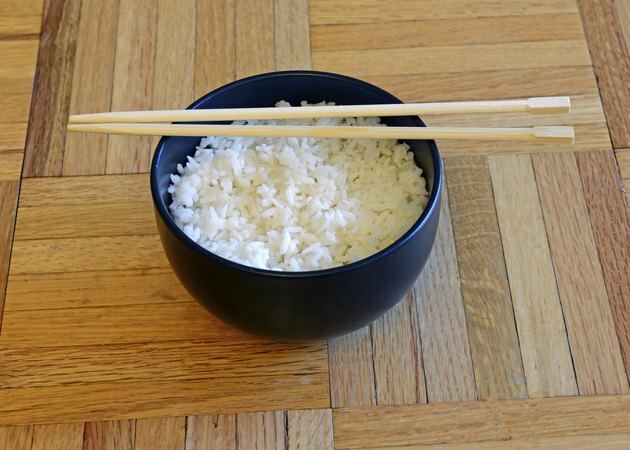 The protein in the rice does not provide all the essential amino acids, making it an incomplete source of protein. However, if you eat a balanced diet that includes other grains, vegetables, nuts, seeds and beans, you should meet your essential amino acid needs. Daily protein needs vary with gender, age and health. Adult women in good health require 46 grams of protein a day, and adult men in good health require 56 grams. Sona masoori rice is both fat free and sodium free. While both fat and sodium are essential nutrients, most Americans consume too much. High intakes of both fat and sodium can lead to a greater risk of developing heart disease. For a balanced diet, you should limit fat to 20 to 35 percent of your daily calories, with most of that fat coming from the heart-healthy monounsaturated and polyunsaturated fats found in plant oils, nuts, seeds and fatty fish. The USDA recommends a sodium intake of less than 2,300 milligrams a day, but if you have high blood pressure, you should limit sodium to less than 1,500 milligrams a day.